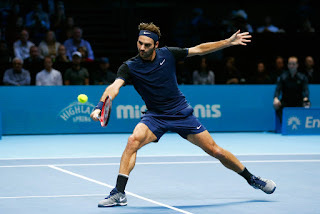 Roger Federer believes shot selection let him down in the ATP World Tour Finals decider against Novak Djokovic as he was beaten 6-3, 6-4 in London. The Serbian top seed claimed the season-ending title for a fourth consecutive year as Federer handed up 31 unforced errors to his opponent. Djokovic, 28, ends the season with 11 title victories, including three grand slams - and it was decision making on court which caused the outcome at the O2 Arena, according to Federer. "It would have been nice to serve a little bit better early on in the match, play better overall on his second serve, because he does allow you to play on his second serve," he said. "Maybe at times I went for too much. The moments where I should have gone safe, I didn't, and vice versa. Those are the two regrets I have. "If I played the match again, that is what I would try to do different. Other than that, I thought it was a good match. It was close. "First six games were tough, to be down 4-2. I had my chances to at least be even. But I thought he played well. Still high-quality match, I thought." Federer finishes the year at 63-11 match win / loss overall, including a 39-6 mark on hard courts. Though coming into the final at The O2 he still had a shot at No. 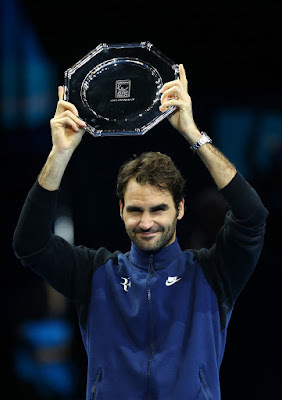 2 in the year-end ATP Rankings, he will finish in the Top 3 for 12th time in past 13 years. At 34, he is the oldest player in the Top 10 since No. 7 Andre Agassi (35) in 2005. 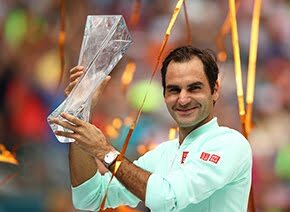 It was a year in which he claimed six titles (Brisbane, Dubai, Istanbul, Halle, Cincinnati and Basel), second only to Djokovic (11). He compiled a 6-5 record in finals, with all five losses coming to Djokovic. In ATP Masters 1000 play, he went 16-6, highlighted by the title in Cincinnati, where he beat Andy Murray and Djokovic in succession, the first time in his 17-year career that he defeated the Nos. 1-2 players in same tournament. With his win over Canada’s Milos Raonic in the Brisbane final, he became one of only three players in the Open Era to hurdle the 1,000-win mark, joining Jimmy Connors and Ivan Lendl. "I've got to keep pushing forward," said Federer. "Got to keep practising hard, being serious about all the things I do. Now rest, recover, enjoy my family, my wife. Just have a great time there. Then once I get back to practice, the gym, enjoy that part as well, which I do. Thankfully, I found a way to embrace that part as well over the years." If he’s proven one thing in 2015, it’s that he is far from done. 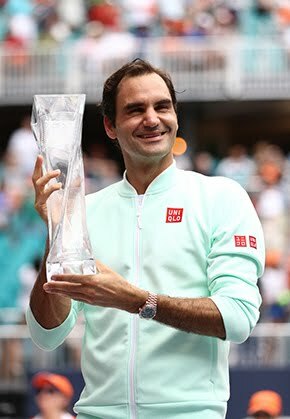 Some 17 years into his professional career, Federer still has the desire, the determination to grind it out it week to week on the ATP World Tour in search of titles. "I think this year had a lot of great things in my game," he said on Sunday. "How I'm able to play at net now, how I'm moving and feeling at net in particular is a great thing to have. Then my serve has been really working very consistent, very well throughout the year more or less. Maybe if I can just get that to work slightly better at times, that would be incredibly helpful. I'll work on that as well. "I haven't thought about it too much in terms of what is my number one, number two, number three goals," he added. "Usually, I go into a season with two or three really big goals, then maybe four or five other ones that are really important to you. The rest of the tournaments I just really enjoy playing. I'd like to defend my titles. But right now my mind somehow doesn't go further than the Australian Open." Federer says it will be tough for Djokovic to replicate his sensational form next year, and claims only minor changes could have a huge impact. "It's hard to do. It's hard to play at this pace all the time. Doesn't need much, you know. We're talking margins," he said. "You don't win a break point, he does, vice versa, it changes the whole outcome of the match. You can't always be on the winning side. Margins are small at the very top. That's why this year of Novak's is amazing. "Rafa has been there. I've been there. We both know how hard it is to back it up year after year. It's not the first good year of Novak. Clearly he's going into next year with massive confidence. "He's playing great. It's going to be hard for him to play a bad year, that's for sure. But this extremely good, it's always tough. But right now you would think it is somewhat possible, but you can't just repeat a year like this. It takes a lot of effort. "You've got to be physically in shape, no injuries whatsoever. Mentally you have to be at your peak at all times. It's not as easy as it seems sometimes."